Greg Meehan has done it again and grabbed another top-tier recruit, this one out of the Bellevue Club Swim Team and Bellevue High School in Washington. She’s a true IM star, which leaves the door open for her to specialize in whatever individual stroke events develops best. She got her first taste of representing Team USA at the 2014 Jr. Pan Pac Championships in Hawaii, where she placed 3rd in the 200 IM in 2:14.18. She was also the 2014 long course Junior National Champion in both the 200 IM and 400 IM. It’s hard to say how Williams will fit into the Stanford team, which is now so deep in every race. When she arrives on campus, Stanford will be deep pretty much everywhere, with the one real hole being the IM’s – Williams’ specialty. That could be a great fit for her because she doesn’t need to fit into any relays, but could develop into a valuable relay swimmer in the long term like Maya DiRado did. Meehan’s 2015 class now includes #1 recruit Katie Ledecky, #6 recruit Ella Eastin, Kaitlyn Albertoli, and Williams. 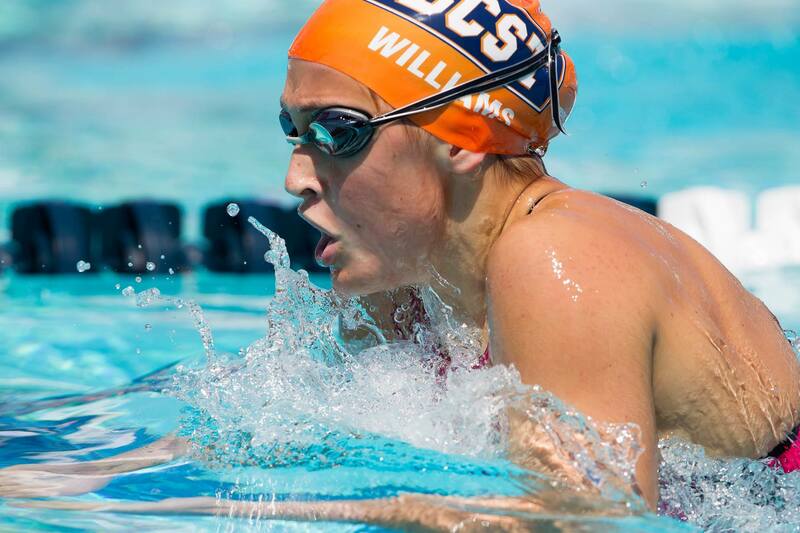 Williams and Eastin are the #1 and #2 ranked 200 and 400 IM’ers on the 2014 U.S. Junior National Team, and are the #2 and #5-ranked 18-and-unders overall in the 200 IM. Williams is the two-time defending Washington 3A (middle-sized schools) State Champion in the 200 IM, and the three-time defending State Champion in the 100 breaststroke. Stanford’s going to be unbeatable. Welcome Williams to the family! You will enjoy the very best education there is to have out there on top of repping the probable NCAA champs for the next half decade (and much longer). It may seem so unfair to Cal, USC, Texas, Arizona & Georgia supporters that the cream of the crop has continued to gravitate to the Card these last few years. But no one’s forcing anyone to pick their college choices, so this is as much a testimony to Meehan and his coaching staff’s well-deserved reputation as it is to Stanford’s. Hey Swimnerd – also speaking as a member of “the family,” I don’t care for your heavy handed, snarky tone – it makes me question whether we really are “related.” In fact, these comments are so oafish and inelegant that I’m beginning to think this is a false flag – doesn’t smell like a sequoia sempervirens to me. I have to wonder if the economy has anything to do with Stanford’s huge recruiting successes. Twenty years ago, a top-tier swimmer could expect to get a good job after swimming for Stanford, Texas, Auburn, or anywhere else. These days, most University graduates spend their entire 20s in financial turmoil. While it’s never a guarantee, Stanford’s academic reputation (plus the fact that they offer scholarships to cover the insane price tag, unlike the Ivies), has to be a significant factor for any smart family. Been watching this girl since she was 10. Not the least bit surprised. She’s humble, hard working, and amazingly talented. Congrats Kim!